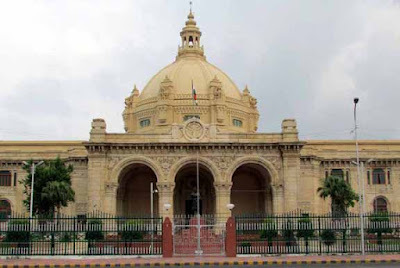 Lucknow : Bedlam created by a united opposition on Monday forced Uttar Pradesh assembly Speaker Mata Prasad Pandey to adjourn the house for the day. As the house took up question hour on the second day of the monsoon session, opposition parties – the BJP and the BSP – waved placards against the Akhilesh Yadav government. Even as the speaker tried to pacify them, opposition legislators trooped into the well of the house and started raising anti-government slogans. The opposition MLAs alleged that there was complete breakdown of law and order in the state. Failing to persuade the opposition members, the speaker first adjourned the house for 20 minutes, then till 12:20 p.m. and finally for the day. Legislators of the BSP, the BJP, the Rashtriya Lok Dal and the Congress demanded the suspension of question hour and immediate discussion on the demands raised by them. Pandey asked them to raise issues under rule-56 but the opposition did not heed his request. After the house was adjourned till Tuesday, Leader of Opposition Swamy Prasad Maurya told reporters that the state was in the “throes on an unprecedented chaos”. “People are being killed in broad daylight, women are being raped, now even the police stations have become unsafe, this corrupt and mafia supporting government has no right to continue in office any longer,” he said. Leader of the BJP legislature party Suresh Khanna said the state was faced with an unprecedented breakdown in law and order and the state government will have to answer their questions. “The power situation is grim, farmers are not being given their dues, land grabbing is the order of the day and the state government is busy shielding corrupt officials,” he told the media.